Airports? Please. Those are soooo 20th century. 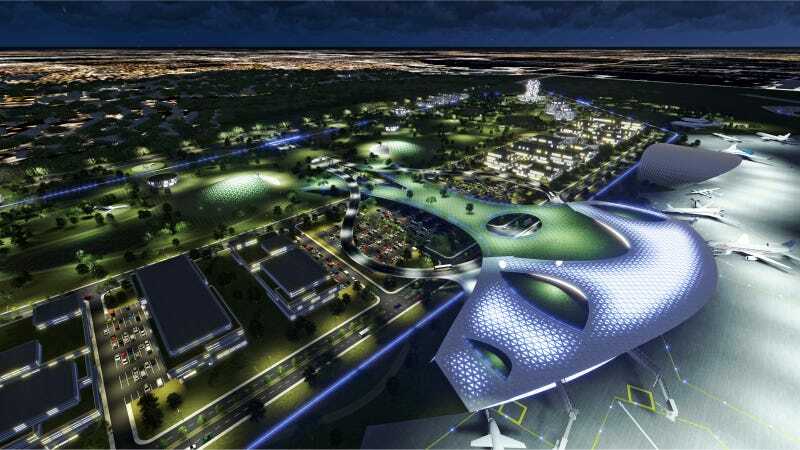 The new millennium is all about spaceports, and if they look half as cool as these concept renderings for a possible Houston Spaceport, then we'll be traveling to the stars in style. The Houston Airport System today released new concepts for the future of the Ellington Airport, ones that include a possible spaceport. The renderings include a terminal, an aviation museum and facilities for the aerospace industries that could move nearby. It's not just science fiction, either. The Houston Airport System started exploring plans for a possible spaceport back in 2011, and in July they secured approval from the Houston City Council to pay $718,000 to a consulting firm who will study how Ellington Airport can obtain a spaceport launch site operator’s license, the Houston Business Journal reports. Such a facility could provide for space tourism, astronaut training and commercial spaceflights. Will a Houston Spaceport really happen someday? It's starting to sound less and less fantastical, that's for sure.